Come, receive the Light which never fades! By His death and resurrection Christ has defeated Death once and for all. He destroys our enslavement to sin. Through faith He offers us new life. Let us celebrate the Resurrection of Christ and, in faith, allow Him to transform our lives. Kristus Prisikėlė! Tikrai Jis Prisikėlė! This was the first notice of the good news of the Feast of the Nativity, brought by the heavenly angels on Christmas night, addressed to the shepherds of Beit Sahur and Bethlehem, and through them to the whole of humanity – to each man and woman in every time and place. The visit of Patriarch Emeritus Gregorios III to Renningen came as a complete surprise. He was able to tell us something about current events in Syria today. It seems as though the struggle against so-called Islamic State is drawing to an end. What the country needs is not a military victory on the part of the Russians or the Americans, but readiness for reconciliation. “People who are not ready for reconciliation have no place in this country. We just can’t go on living in a state of war,” said the patriarch. His main concern is with those who want to return to their ruined homes. Many are still undecided, as the patriarch reported, but the majority would like to go back. He is particularly concerned with Daraya, to which some fifty families comprising some six hundred persons are about to return: they need help. It is also important for the sixty-bed hospital in Khabab, some forty miles from Damascus, to be completed. For this, furnishings and beds are required. The most important task, according to the patriarch, is to make the terrorists human again, and do away with their hatred and enmity, in order to reintroduce peace to the country. 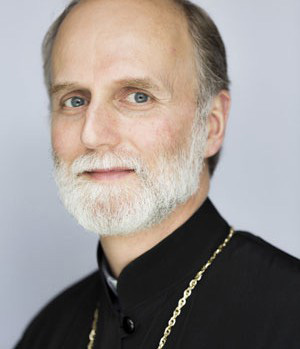 Renningen’s Catholic priest, Father Franz Pitzal has pledged support to the patriarch and even given a small contribution towards the reconstruction. The patriarch, who also used to have responsibility for Jerusalem, bestowed on Father Pitzal the patriarchal Cross of Jerusalem, and, which is much more important for an orthodox Church, an antimension too. 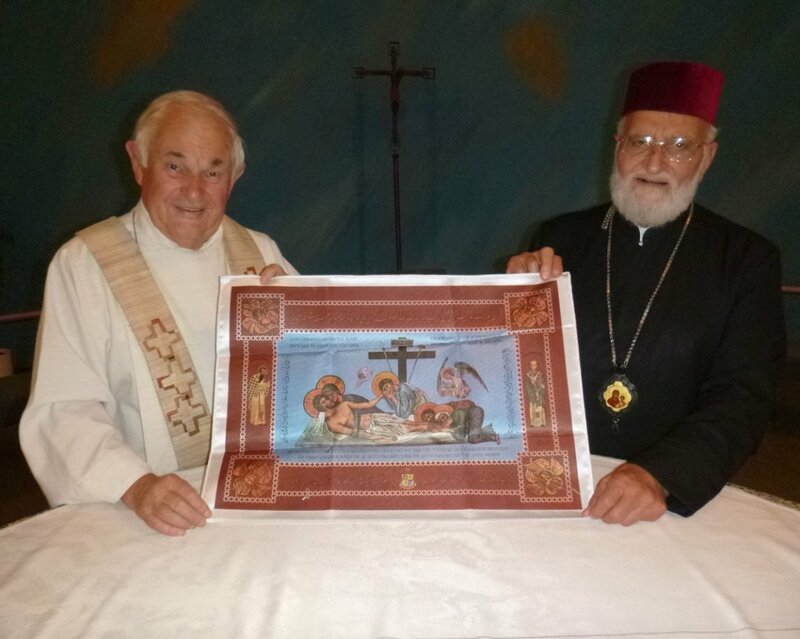 That is an altar-cloth, which in the Eastern rite acts as a reliquary cover, similar to the way relics are placed below the altar in catholic Churches. In Renningen city centre, the patriarch noted enthusiastically the capital letter H standing for the one hundred and one countries, including Syria, to which Renningen sends help. He was also very interested in the Way of the Cross, which Father Pitzal has created for the Renninger Church and which connects current developments with the Passion of Christ. Patriarch Emeritus Gregorios III was happy to participate in the abbey’s celebrations. In the morning, a solemn mass had been celebrated by Bishop Stefan Oster in the basilica, after which followed a concert in the upper church, with speeches from the abbot, Marianus Bieber, the state-minister Bernd Sibler and the district councillor, Christian Bernreiter. In the afternoon, His Beatitude presided at Byzantine Vespers in the St Nicholas Church. The whole occasion offered a good opportunity for him to visit the abbey and join in the festivities. He brought the monks greetings from the Holy Land, and from the countries suffering from war, from Palestine with its seventy-year long conflict, from Iraq, and from Syria, now in its eighth year of crisis. He writes, “My presence was a reminder of my predecessor, Maximos IV’s visiting Niederaltaich during the International Eucharistic Conference in Munich (1960), and later, on the occasion of the Second Vatican Council, together with some bishops of the Melkite Church.